On November 13, a busload of students and residents went from SRSG to Jolly Grand (I am sure that this has a different spelling and meaning, but that is the way I hear it) about halfway between Rishikesh and Dehradun. This is where Swami Rama established a teaching hospital, Himalayan Institute Hospital Trust, a few years before his death. Indeed, his samadhi is still on the grounds. The annual festival is called the Mahasamadhi Anniversary, commemorating Swami Rama's disappearance day. This was the 12th such annual festival. HIHT began with only an outpatient clinic, but the present status of the institution is pretty impressive. In the past year, it was granted "Deemed University" status, as HIHT University, and has numerous departments, mostly related to the health sciences. 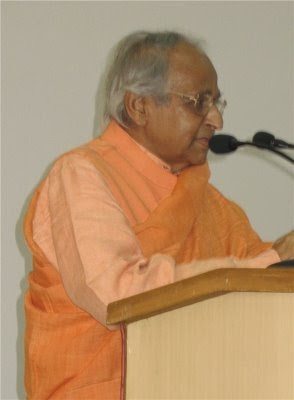 Swami Veda is the chancellor of the university. The director is the very dynamic Vijaya Dasmana, who was with Swami Rama from childhood, and says Swami Veda, was brought up by him specifically for the task to which he has now dedicated his life. Judging from the results, he is extremely capable. 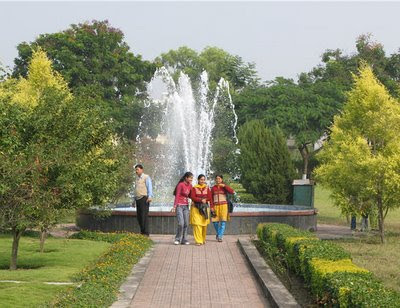 You can see from this picture how nicely designed and maintained the campus is. The current plan is to have the SRSG Gurukula become a part of the HIHT University and offer degrees in Yoga and related matters. Most of the staff here is currently devising a curriculum toward that end. I had the pleasure of meeting Ashok Bhagat of Vikas Bharti Bishunpur in Jharkhand. 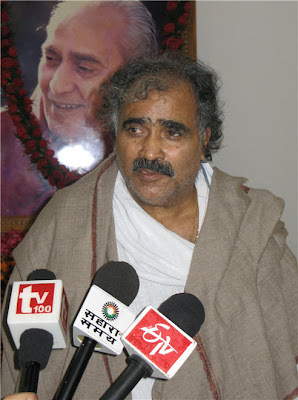 The HIHT offers an annual prize, the Swami Rama Humanitarian Award, and Sri Bhagatji was the recipient this year for his work with the aboriginal or tribal people of the Jharkhand area. Jharkhand was carved out of Bihar a few years ago, primarily to further the development of a much neglected group of people. Bhagatji has dedicated himself to that work and has rather impressive achievements in a wide range of areas--health, education, agriculture, etc. You can see from his picture that he is shirtless. This comes from his conviction that one has to place oneself amongst the people one claims to be helping, rather than placing oneself in a condescending position. His main inspirations are Vivekananda and Gandhi. 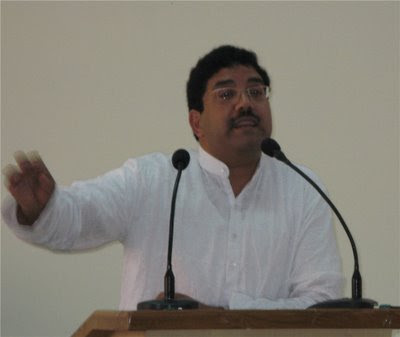 Swami Veda Bharati gave the keynote address. He is not only chancellor but "spiritual director." In that capacity, he did something which was rather unusual for what, to all appearances, is a quite secular institution. He led a silent meditation for three minutes. What was striking about it was that in a restless audience of several hundred people (liberally stocked with SRSG folk), the auditorium became totally silent and for the entire five minutes, there was neither whispered conversation nor ringing cellphone. Believe me, that is a first for me in India. Later I was talking with Swamiji and I told him how I once went to Bangladesh where a godbrother was holding a kirtan and festival at his house. I remembered how disciplined the Muslims I had seen in the mosque were and how undisciplined and disrespectful the ordinary Hindus had been at the Vaishnava event. Swamiji said that he had not asked nor received any mystic powers from his guru, but he could claim this one. And he said that he had been able to bring crowds far larger than this one--even tens of thousands--into a state of silence. Now, that is something worth learning.